I know I haven't been drawing at all lately. But the other day Celina got into my portfolio and then one of my old sketchbooks. She found the plans for one of my high school art projects - a temple with an East Asian-inspired goddess standing inside. The whole assignment was supposed to be made out of cardboard, with a sculpture of some sort included somewhere on the project. Anyways, hearing me describe it, she decided to make one of her own. We got an old cardboard box, and then we started doing some sketching. She wanted something more Egyptian-themed (of course! ), so we looked at books, patterns, paper dolls, and online for inspiration. I would copy down some things she liked, she would draw a figure of what she wanted, and we went back and forth drawing until we came to something she really liked. Her "statue" (it will be made out of paper since we don't have any clay handy in the house) is her own version of the goddess Hathor. She made me draw the final copy out, and she colored it. So I DREW! Somehow I wound up making her taller than the piece of paper (it had to fit inside the temple, after all). I think it will still fit. We're going to put the pieces together on a piece of bristol board or card board and it should be able to stand up by itself. And look smoother. closer views. This was as good as I could get because, well, I'm lazy and this isn't really THAT important of a drawing. Her face is modeled off of an OOAK Barbie we saw online. So if you're wondering why she looks Barbie-ish, that's why. Lina decided on everything, from the outfit to the decorations to the pose and facial expression. And so Hathor was colored. Lina used mostly traditional colors. Then, excited to keep moving on, she started work on the temple itself. The outside she left its natural color, so it would look like old wood doors. She decorated with her version of traditional motifs. AAAH!! What is this?! I know it's not finished, but I swear it's the inside of the bottle from I Dream of Jeannie. What kind of Egyptian worshipped inside here? Another view. You can kind of see that there are pillars along the walls, and that mass of blue is supposed to be steps. I was going to adjust the color in these photos, then I realized that they are actually true to life. REVEL in the pink! This is just one letter in a whole page of script attributed to someone known as "Scribe A". I was intrigued by the bird head at the end of the letter. And then there's that weird eye-looking thing at the top. I've never seen anything like it. As you can see, it took me more than one try to get the whole thing to look cohesive. Attempt #1. It kind of looks like a G, but not really like the one in the book. I figured out that the tail was too long and the "eye" was too big. You can clearly see where I erased. And no, I didn't use a ruler or french curves or anything that probably would've made it look more fluid. Just me, my eyes, and my pencil (and my eraser). I think the inking is and always will be my favorite part. It's so relaxing. And also so rewarding once things get going. 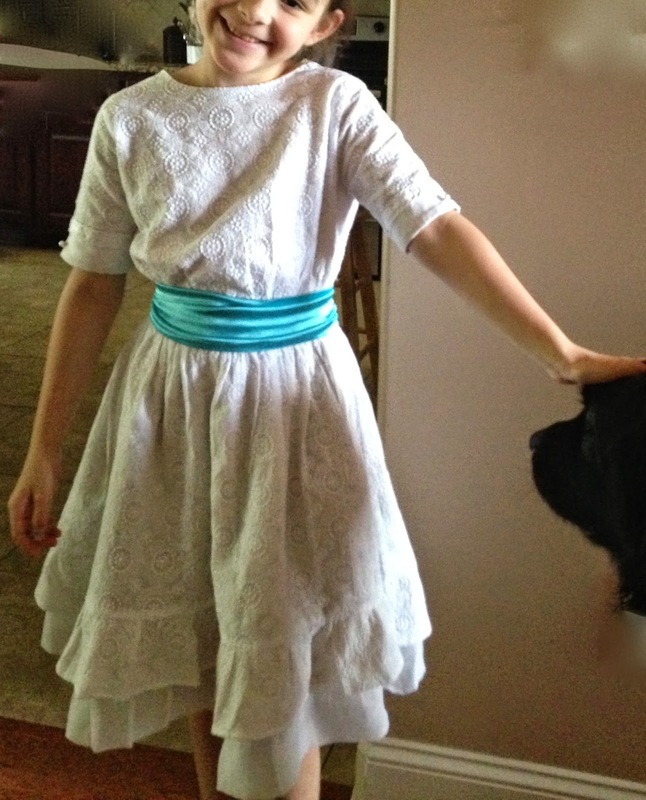 My girl wanted a new dress to wear to her recital, and she'd been dying for a dress like Mary wears in "The Secret Garden." She picked out some fabric at Jo-ann, and I went to work. Unfortunately, she grew while this was in production, so I had to add a placket to the back so that it would button. I was known for my baking skills, and used to paint and draw as easily as I breathed. Join me as I touch up my old skills, discover the ups and downs of healthy eating, and learn how to sew!